I planted four long beds in this space this spring. 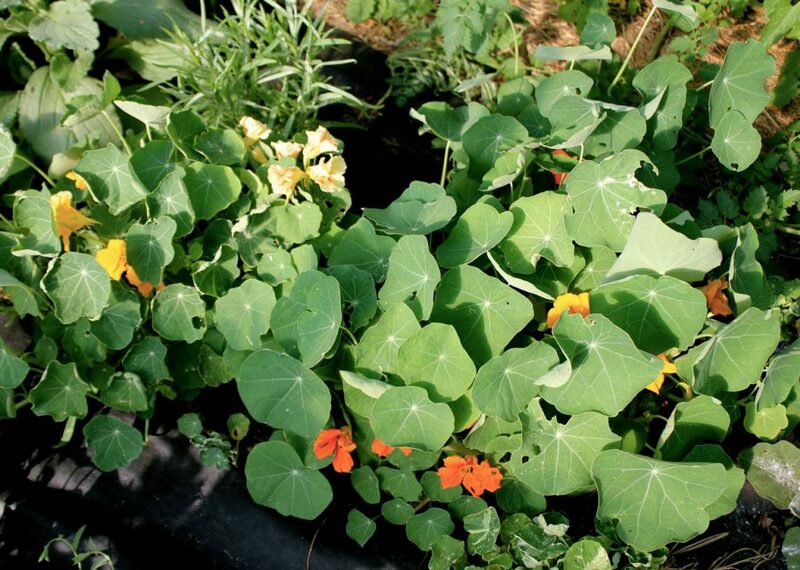 From the left, they are growing: edible flowers and gherkins, heirloom tomatoes, squash and nasturtiums, peppers and eggplants. Curious? 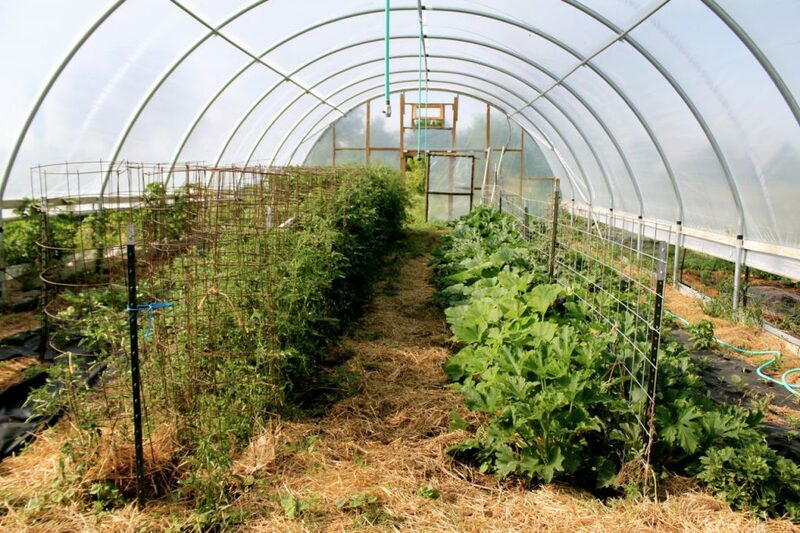 My hoop house is my most valuable real estate, garden-wise, and I plan what I’m going to put in there very carefully. The crops that I grow in this space have to like heat (’cause boy does it get hot!) and benefit from a little more protection. I took a few snapshots just for you guys and gals. 🙂 Welcome to my hoop house. After I’ve taken care of feeding all our critters, I do my work in the hoop house first. It gets incredibly hot in there, and buggy, so I have to work fast and early. Heat exhaustion is not something I want to tangle with this summer, and biting flies–my goodness, those things are nasty! 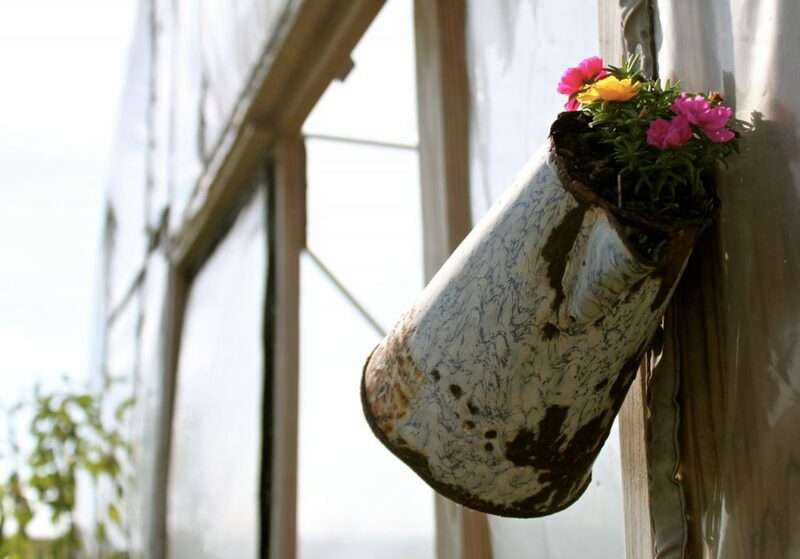 Wanna peek inside my hoop house? Welcome! Come see what’s growing! 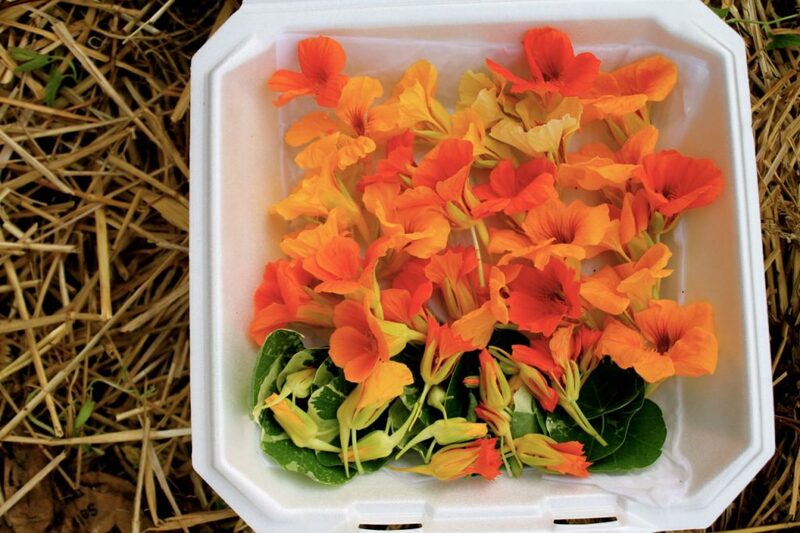 Did you know that there were so many flowers that you can eat? 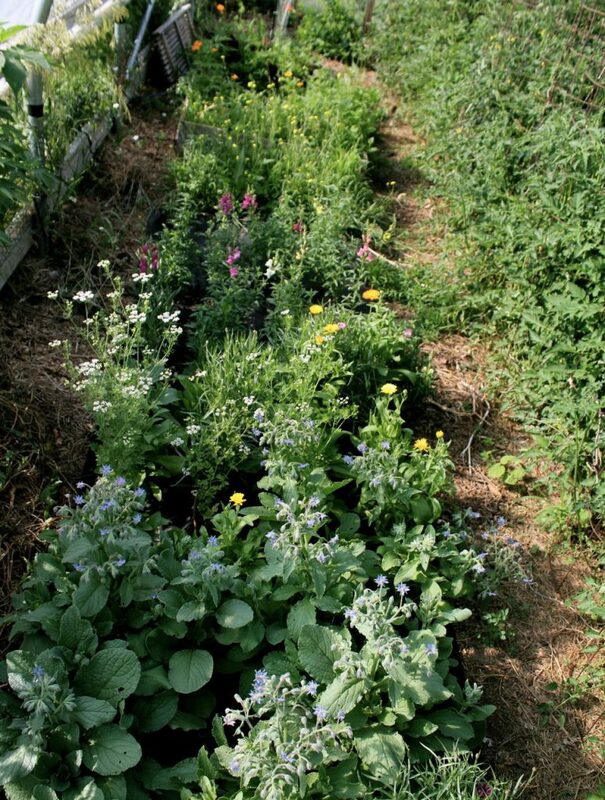 I planted just a few: borage, calendula, cilantro, snapdragons, nasturtiums, and I let some arugula go to seed, too. 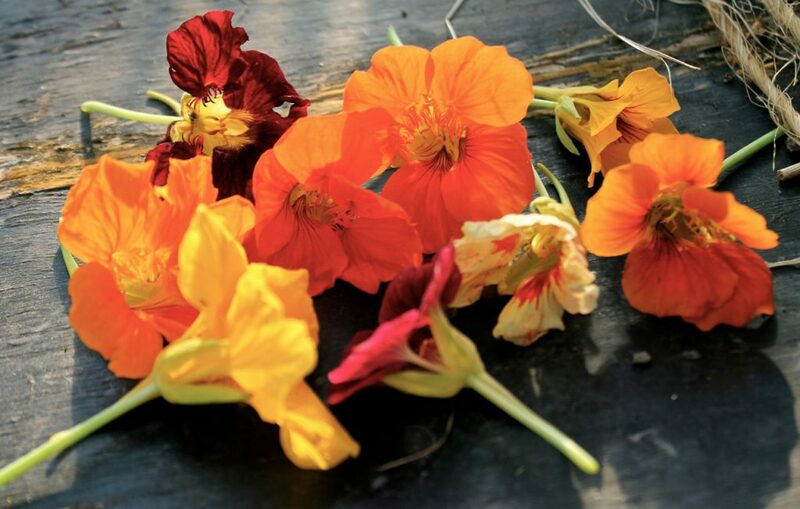 Several colors of nasturtiums look so pretty together. And what could be more romantic than eating flowers for dinner? I discovered that the hoop house is a great place to take pictures during Golden Hour, too. Look at these monsters! Already reaching out of the 5′ cages. And I took this picture in early June. Slow down, guys! 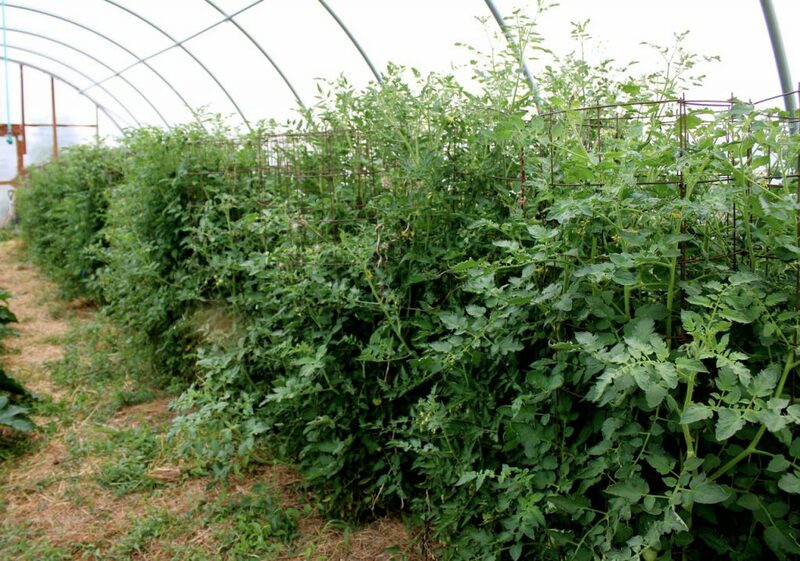 The first summer I had this hoop house, I planted just a couple of tomato plants in it, just to see how they would do . . . they grew faster and bigger and were more productive than the tomatoes out in my open garden. Ever since, I’ve planted at least a quarter of my hoop house space in tomatoes. You know how I love all the beautiful heirlooms that are available. Endless variety! My heirloom tomatoes seem to love this space as much as I do. We’re all happy. Much of the past couple seasons of planting in the hoop house has been experimental for me, of course. 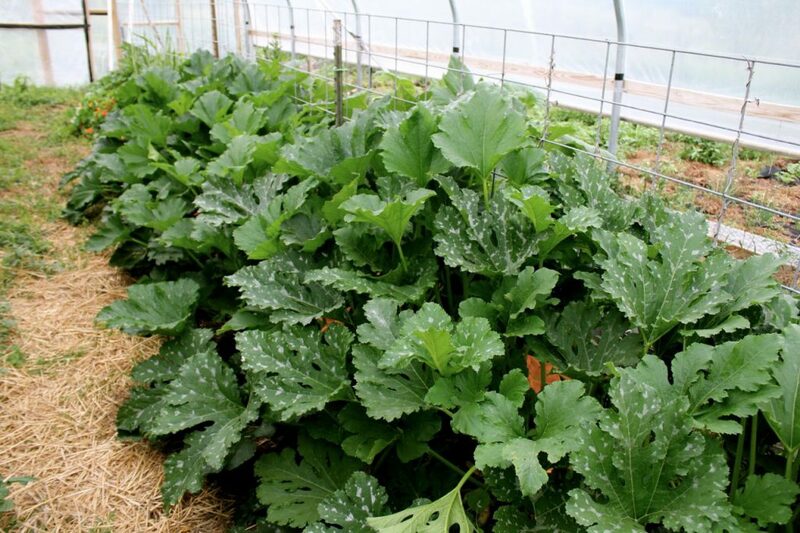 For example, I planted a few lemon squash plants in my hoop house last year, and a few out in the garden. We have a lot of pests in our area that like to kill squash plants–among them, the cucumber beetle, the squash bug, and my own personal nemesis: the squash vine borer. Probably others, too, darn it. Of course the way things go, the dastardly villain could find its way into that vaulted space and kill every last plant in there. But hopefully that won’t happen. I planted nearly an entire bed with small specialty squashes and zucchinis. They are so beautiful. The plants are lush and gorgeous. These guys are monsters, too! From top left, clockwise: Lucky 8, Magna, Floridor. My favorite, lemon squash, is nearly ready to pick. 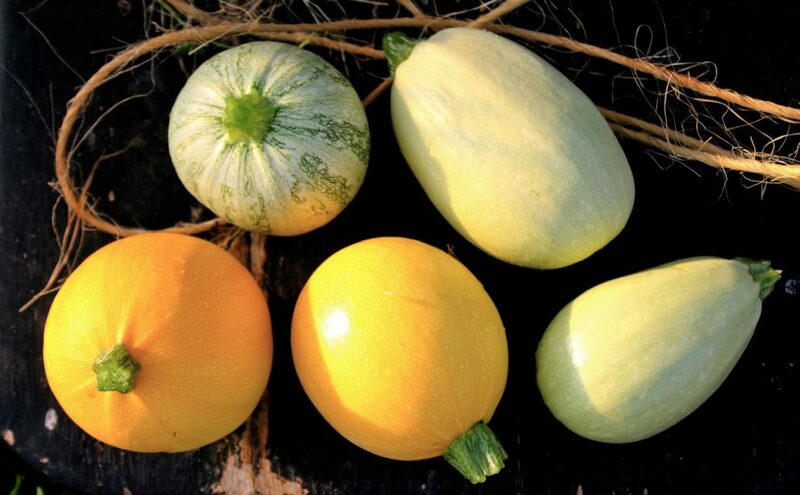 These little squashes are great in a stir-fry, or sliced up and grilled. I have a feeling we’ll be eating them at least once a day until fall. 🙂 I planted a lot of them (*loosening collar*). 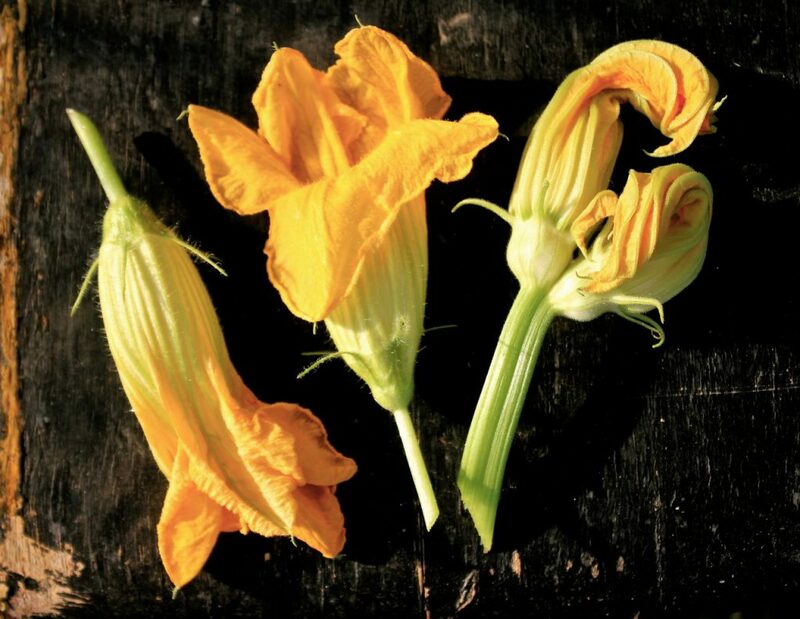 You can eat squash blossoms, too, did you know? But you have to be careful to harvest the male blossoms, not the female ones. They are very delicate, but so beautiful! Peppers and eggplants do very well in the heat. I’ve got an entire bed of just peppers and eggplants, including some very unusual varieties. There are a lot of buds setting on! You can read more about this dainty pepper here on the Baker Creek Heirloom Seeds website. 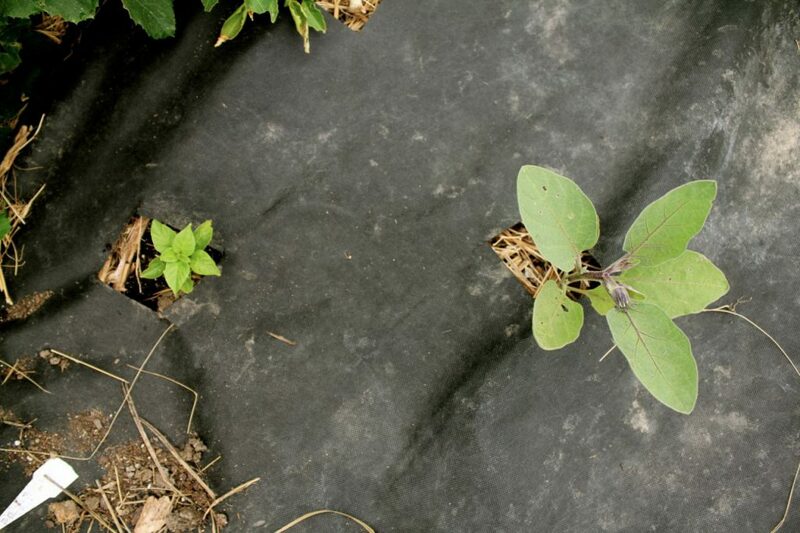 On the left is a biquinto pepper plant; on the right is an eggplant plant. So–tiny!! 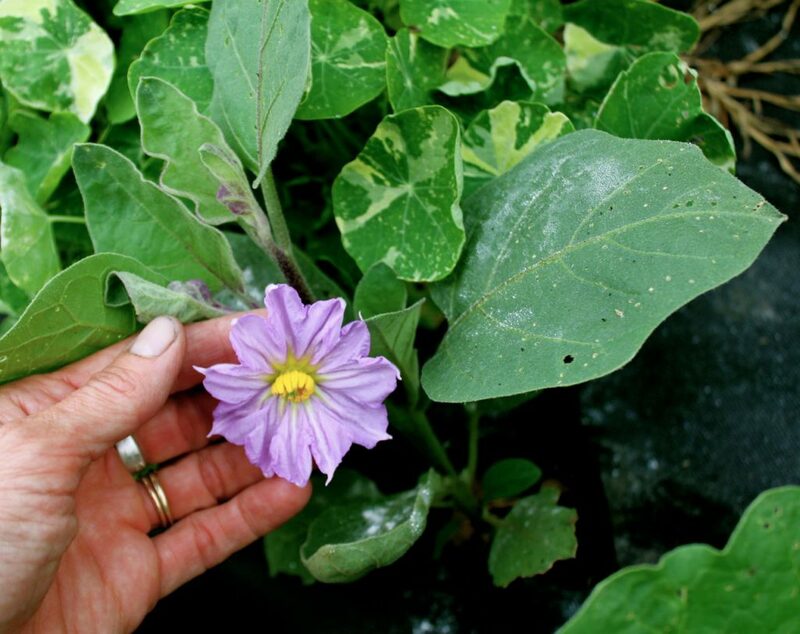 One last thing: did you know that eggplants had such beautiful blossoms? Thanks for stopping by, Gentle Reader. If you’re ever in my neck of the woods, give me a hollar. I’ll give you a tour for real! p.s.! Just a few more days to enter my giveaway of 3 little bottles of doTerra Essential Oils! Better click on over there and enter! ….sorry can’t quite finish what I wanted to share…all I know is there will be…another or do I dare say even others? Forward march honey and keep reminding us to stop an smell the beautiful squash blossoms. Lucy, you are always such a blessing to me. Thanks for taking the time to pop in to say hello!! Amy! 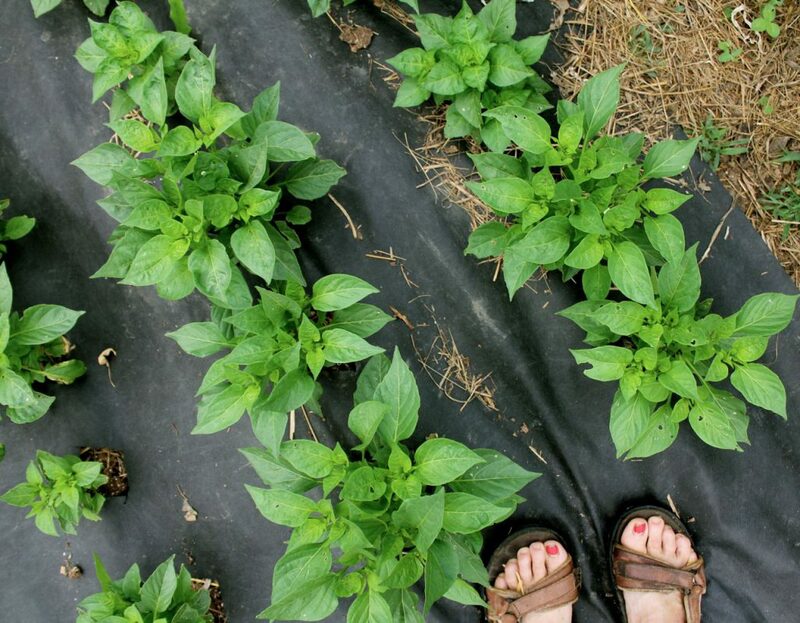 OMG, I can hardly stand NOT having a hoop house like yours! If I were the jealous type, I would be an extremely jealous one right now….sigh, thankfully I’m more envious than jealous….but not in a bad way. I “need” one of these hoop houses. Seriously. And if I could swing it, I’d be in your neck of the woods later this afternoon….or maybe early in the morning when it isn’t so hot…and I’d for sure be begging for a tour. 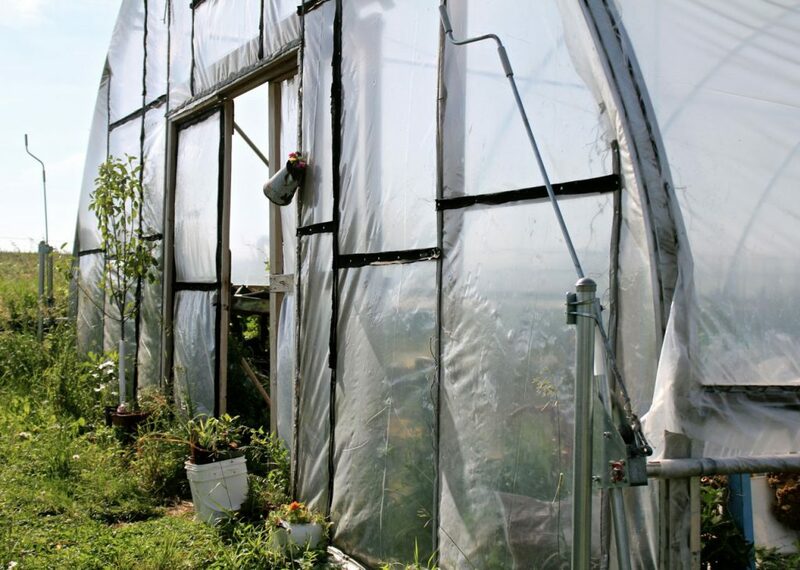 Where can I find all the info on this hoop house? I would search your site but I have to be gone all day today….please share with me? Those plants are amazing….you go girl! 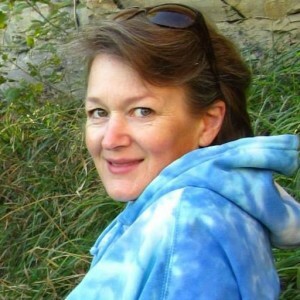 Please let me know if this works or helps at all, Lynda! This is so cool! Your tomato plants are HUGE! Nathana, I know—they amaze me, too! Amy, those biquinto peppers are adorable, I’m a sucker for the shiny little red ones! 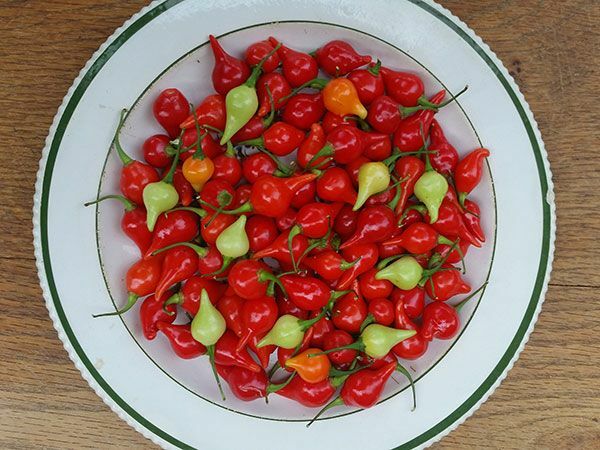 I grew serranos for the first time last year and they made me so happy to see the shiny red POP! against the green foliage. I was glad that I had placed that one within view of my kitchen window. You are welcome, Tina! And I will remember to write a favorite pepper post at the end of the season, especially for Tina! 🙂 Happy gardening, my friend! 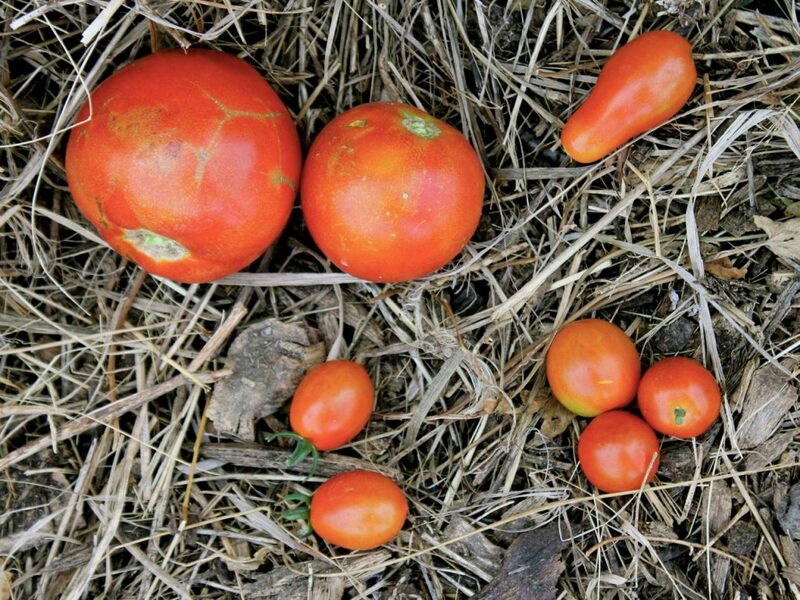 Your tomatoes are amazing. Much larger than mine in the high tunnel. 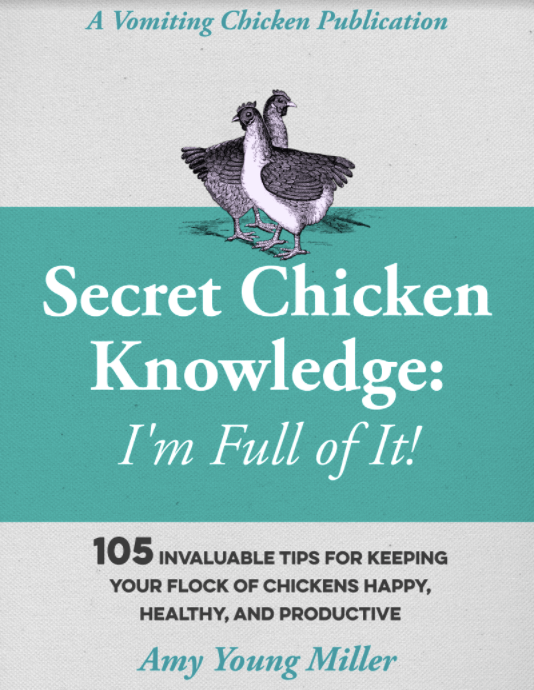 They must totally love that hen house litter! Amazingly, my Biquinho peppers are now a big globe about 16″ in diameter. And there are lots of tiny peppers already set on. Rabbits just ate every single one of my shishito peppers – for the third time – and I have no more backups to replant. So far, I’ve harvested a few pounds of ordinary red tomatoes and a quart of cherry and grape tomatoes, quite a few small cukes and a couple of sweet peppers out of the high tunnel. Nothing outside yet, except the predictable radishes, green onions, baby turnips and kohlrabi. Oh yeh, 2 heads of broc so far. Stop by next time you’re heading to Lincoln on Hiway 33!